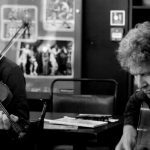 As the 14th Liverpool Irish Festival offers a glimpse of Ireland’s history, present culture and the relation between the two, Getintothis’ Amaan Khan experiences something special. Having had 14 successful years behind it and going on for the 15th next year, The Liverpool Irish Festival is but a cherry on top of the massive exchange of cultural influences between Liverpool and Ireland. Rightly described as a ‘European city’, Liverpool has not only absorbed some Irish influences but it also upholds the Irish culture in its original form around town. While that cross-cultural pollination might be the common thread between all the years of The Liverpool Irish Festival, the 2016 edition was in it’s heart more about the impact of Liverpool and even Great Britain on Ireland in the past and in the uncertain future. The year marked 100th anniversary of Dublin’s Easter Rising that took place in 1916. On April 24, 1916, around 1,500 Irish rebels occupied key buildings in Dublin and read a proclamation declaring a republic. A century later, there is a general climate of political uncertainty. There has been an 83% rise in Irish citizenship applications post-Brexit. With something like that, the impact of demographical exchange on cultures comes into question once again. The aforementioned historical and political aspects were the main grounds of the academic and exhibit-related part of the festival. The Liverpool Central Library showcased a handful of exhibits related mostly to the around fifty individuals from Liverpool that contributed to the Easter Rising and other revolutionary efforts of the time. Advertised as a highlight of the festival, it was on the first Saturday of the festival at the Museum of Liverpool where we found ourselves among families having good times with their kids along with getting a view of Irish culture and history. The Family Day featured performances from ensembles of volunteered instrumentalist of all age, ranging from elderly people to very young children. A constantly changing crowd gathered around as violinists, banjo players and percussionists performed traditional Irish music at the ground level of the museum. Along with educational activities for kids at the floors in between, the top floor featured more exhibits about the Easter Rising and information about the volunteers from Liverpool and a timeline of the entire Irish revolution centred around the Easter Rising and the role of Liverpool. By now, our casual festival-goer should have gained enough background knowledge about the Irish history that a lot of this Festival is themed around. The more academically inclined made their way to a more intellectually stimulating corner of the event which was the talk by Phillip Orr (historian) and Tom Hartley (Lord Mayor of Belfast) entitled The Lily and The Poppy. As explained in the talk, the title signified a payment of respect to the martyrs of the revolution and the renewal of culture respectively denoted by connotations of respect signified by the lily and of renewal by the poppy. The talk featured recollection of Ireland’s social atmosphere in the past and the change it went through with all of it reflected in the headstones at the Belfast City Cemetery. The acknowledgement of the contribution by the female volunteers and the unjust dismissal of the same in the past resonated strongly amongst the more sexism-aware audience of today. The more aged members of the audience offered some chuckles in agreement to a recollection of some old cultural or social experience and gave the atmosphere a more light-hearted flavour. 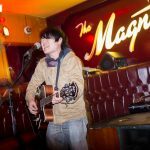 As the whole city had a smattering of Irish flavoured gatherings, from Caledonia, The Magnet to Kelly’s Dispensary, a constant centre of relaxation and casual singing was The Everyman‘s cafe. This part of the festival was titled Social Seisiún, a place for the festival-goers to sit down, relax and casually socialise. 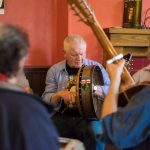 Musicians volunteered to deliver mostly Irish traditional songs over half-hour slots while their audience relaxed to a cup of coffee. The setting here was much more casual. 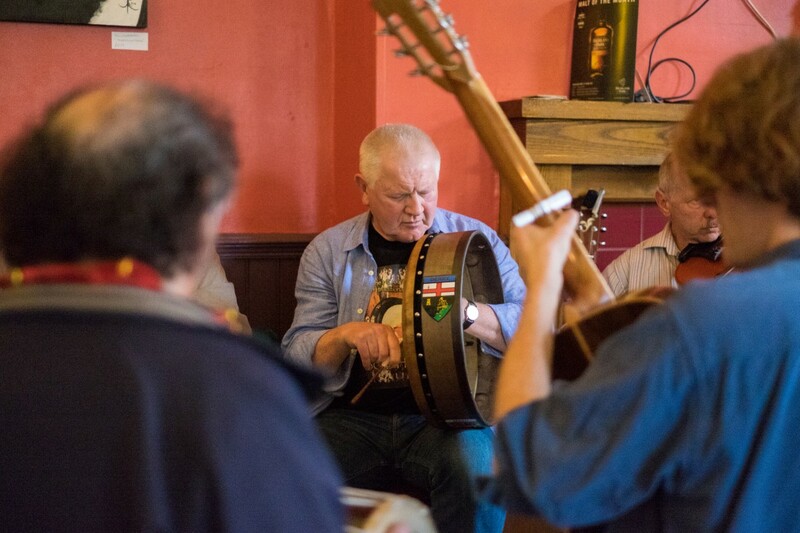 The set timings were flexible and people freely joined in and volunteered to play along to the traditional music. With a bit of socialising here, we found out that the talk on James Joyce’s work that took place earlier in the festival had gone down relatively well with the audience offering insightful participation and steering the discussion to such academic levels where Joyce’s interpretation of various words was even put into question. Adorning one side of the cafe was the festival’s material library housing some Pulitzer Prize winning books along with works of Joyce, Yeats and other notable Irish writers. A significant attraction as one could take from and add to the library for free. Along with the academic and the historical, there was the visual media side of the festival. Plays like Liverpool Lambs, Purgatory and films like 66 Days were part of the festival too. 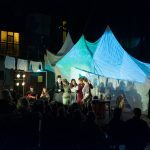 We managed to catch only one play of the festival but it was quite a important one at that being at the very new and flexible venue of Liverpool of The Invisible Wind Factory. The play was Scadán by Lauren O’Hara and Connor Kelly. 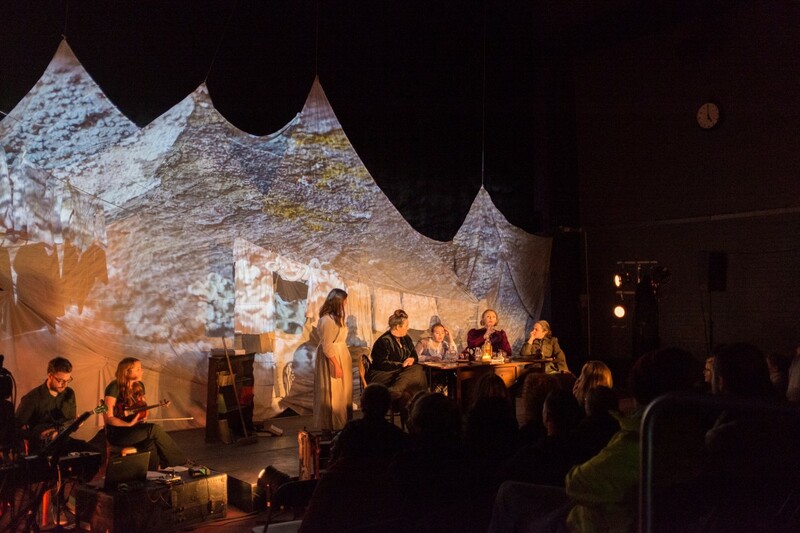 As half of the Invisible Wind Factory is converted into a theatre and we were welcomed with sound of waves and Irish styled music, the play took us into the life of Muireann who leaves her home, the island of Tory, and meets a group of female rebels participating in the revolutionary efforts made at Ireland. After spending some time with them we see her political ignorance turn into strong opinion and active participation in the uprising. 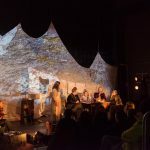 With light and humourous narrative, the play deals with themes of public’s stand on political wrong, feminism and economic and geographical backgrounds of the people who participated in The Rising. Though at first, the traffic noises from right outside the venue seemed to disturb the illusion historical narratives should create, the fact that after a few minutes we stopped noticing those disturbances is a comment in itself to the strong performances of the actors and the creative support from the accompanying musicians. The interval saw free servings of Irish stew to the audience which was something everyone seemed to be happy about. Though during the first ten minutes or so, this writer was doubtful of the choice of venue, the conviction of the acting and the quality of the whole production in general, by the time the play ended to an anthemic hymn supported by projection of the actual female volunteers of the Rising, all the doubts were shunned. The was an unquestionable feeling of witnessing something moving. 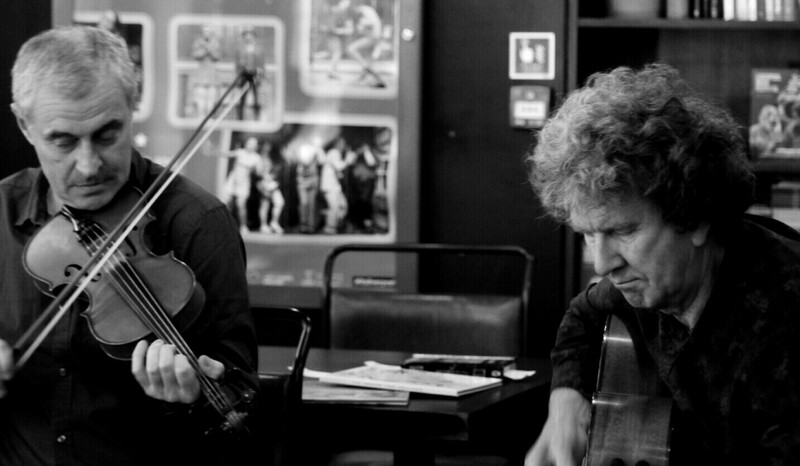 In the end, Scadán shone as a jewel of the whole festival. 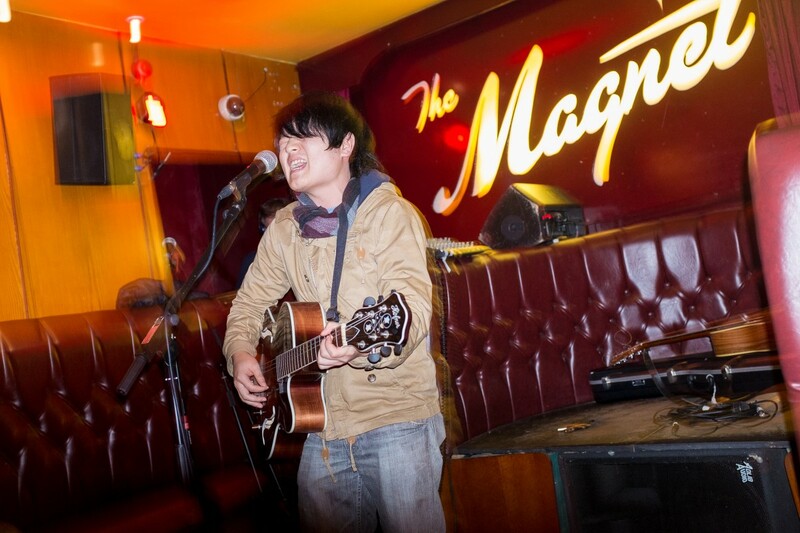 Last, but not the least, music was often the headlining attraction of the day at the festival. 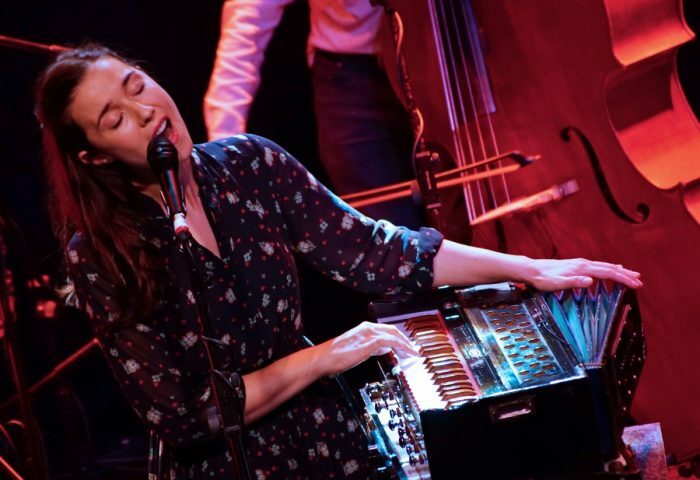 Featuring concerts from some big names like The Divine Comedy, The Logues and Damien Dempsey, the festival is potentially a worth-anticipating time of the year for music lovers alike. On the last Friday, we found ourselves at a choker of an event at The Arts Club. 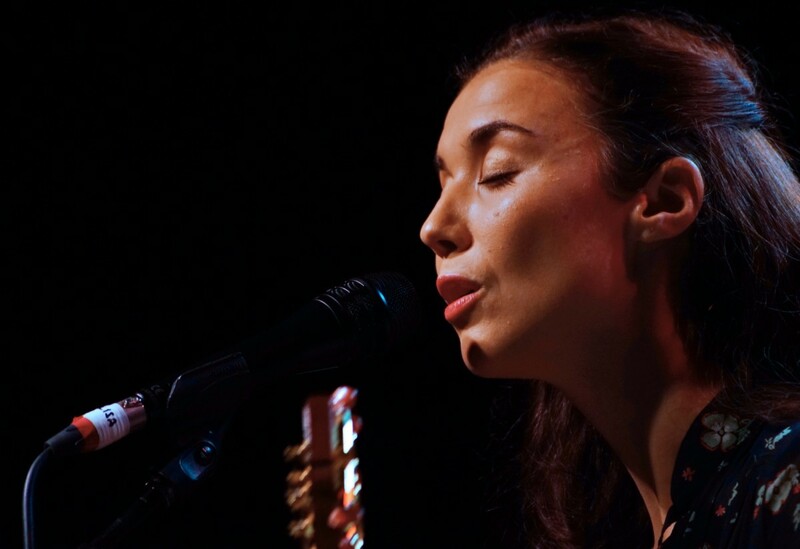 It was the occasion of Lisa Hannigan‘s tour stopping by Arts Club promoting her new album At Swim. 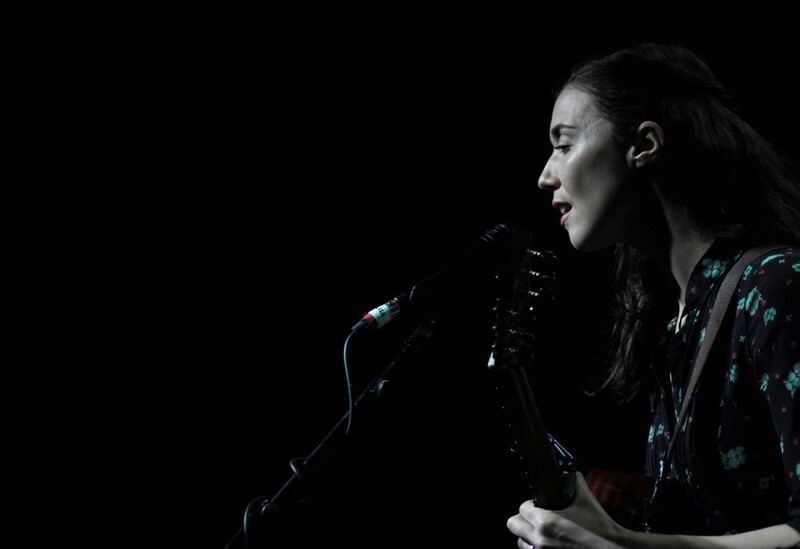 The promoters might like to advertise her as the ex-collaborator and love interest of Damien Rice but for this writer, she is but a living proof that true talent finds its way to an audience regardless of how you package it. 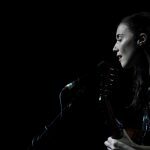 This writer discovered Lisa Hannigan earlier this year at the Mersey River Festival as she performed on a boat at relatively obscure corner of the festival. She stopped us dead in our tracks, making us forget anything that might have been going on at the big main stage. Though there were many attractions around including a guy on water jetpack floating about behind her as she delivered her emotional tunes, she stood out with her authentic voice and songwriting and earned our interest in her. Little did this writer know she was someone who can fully pack a venue like Arts Club. 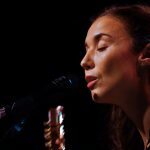 At the Arts Club, Lisa Hannigan addresses a sincerely quiet crowd with some solo tunes from her early days in her career. Her band joins her only after a very heartfelt mandolin-tinged performance of her early hit Passenger. 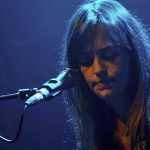 Along with her early numbers like O Sleep, she of course performs most of her tracks from her new albums. 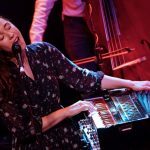 Backed by just a drummer, guitarist and keyboard player, she manages to deliver a set more dynamic than most bigger bands manage on their good days. Harmonium. Xylophone. Bowed guitars. There is a wide palette of sound to please every ear. There’s recurring humuorous mention of the Mersey River Festival and the water jet pack distraction who she delightfully names as ‘Jet Pack John’. 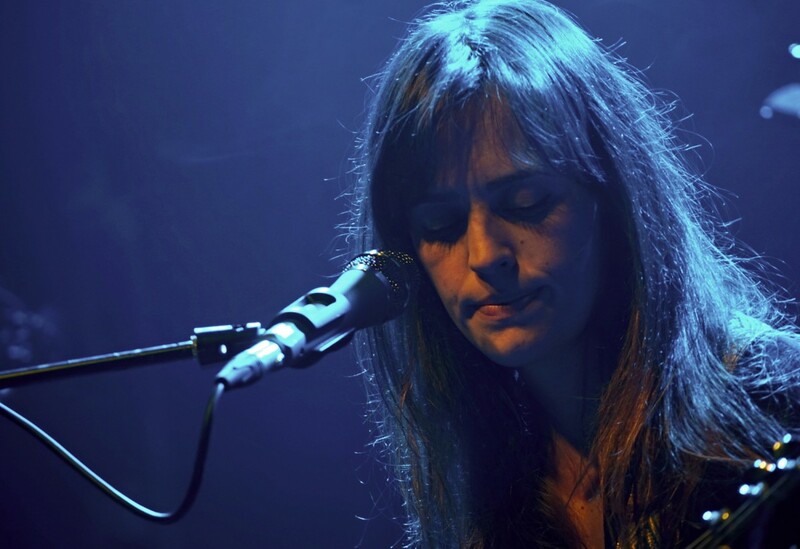 Her lead single from the album, Fall, is undoubtedly the highlight of her set alongside Prayer for the Dying. Later on in the set, with her tune Undertow, she even offers us some electronic drumbeats, surprising our ears even further and not letting the evening grow monotonous. Far from it, actually, the evening seemed to be one of the best concerts this writer has been to in a long time. After some a capella performance and revisiting Fall, she bids us adieu amidst some genuinely enthusiastic applause. All this was just a fraction of what Liverpool Irish Festival brought to the city of Liverpool in 2016. 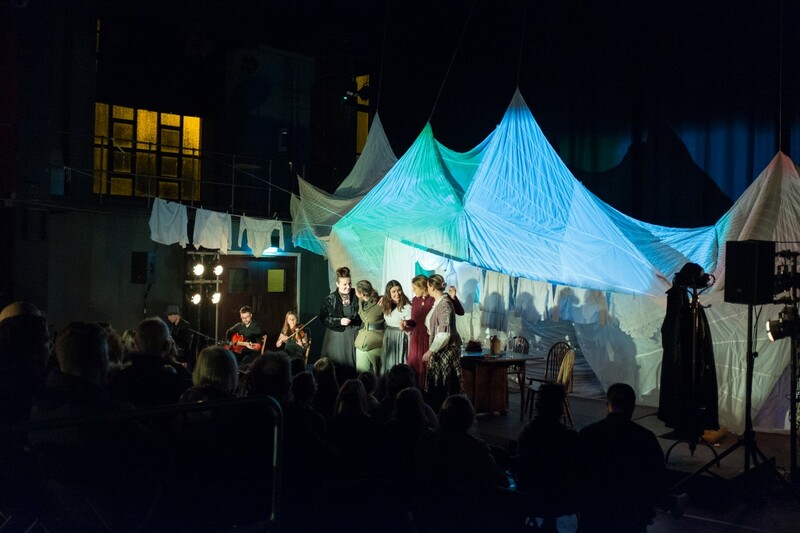 The events ranged from plays, film screenings, academic talks, musical performances, story-telling, heritage walks and much more. It is one of the more dynamic and relaxed festivals that take place around the town. The amount of enjoyment and comfort that city finds in these ten days just drives home the very first point about how closely related our cultures have been with Ireland. One does not need to engage in long debates to realise that, having a spoon of Scouse followed by a spoon of Irish stew is enough to tell you how close the two cultures are. Liverpool Irish Festival is but a celebration and commemoration of these beautiful relations.